Bouvardia sgl. 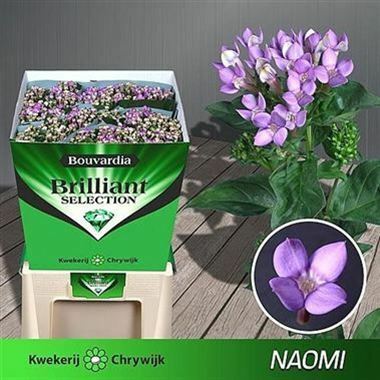 Royal Naomi is a Lilac cut flower. It is approx. 70cm and wholesaled in Batches of 10 stems. A genus of the Rubiaceae family, Bouvardia is a plant native to the tropical Americas. Named after a French doctor called Charles Bouvard, bouvardia flowers are small trumpet shapes that form loose clusters edged with bright green leaves.